Finally, the day has arrived to launch Pontoon! It’s a big pleasure for me to announce that the first application we will localize with Pontoon is Mozilla’s latest and greatest project, Firefox OS. 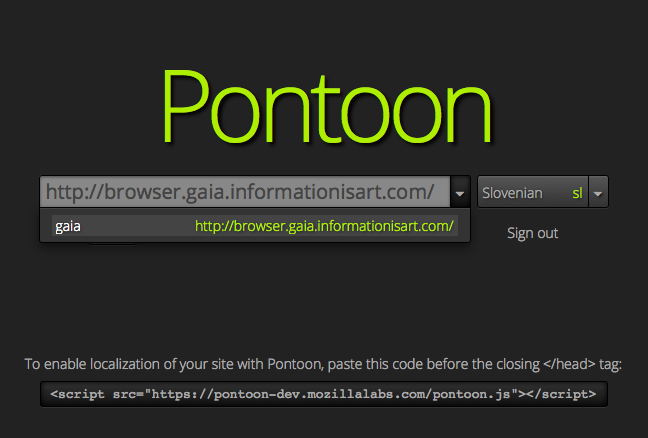 To be more precise, we will use Pontoon to localize Gaia, the user interface of Firefox OS. You can learn more about Gaia localization in general by reading Staś’ announcement in the newsgroup. OK, so how do I localize Gaia with Pontoon? 1. Simply select Gaia from the project menu and pick one of the supported locales. 2. The Browser app will load by default in the external window, but you need to allow pop-ups first. Strings available in HG are already imported. 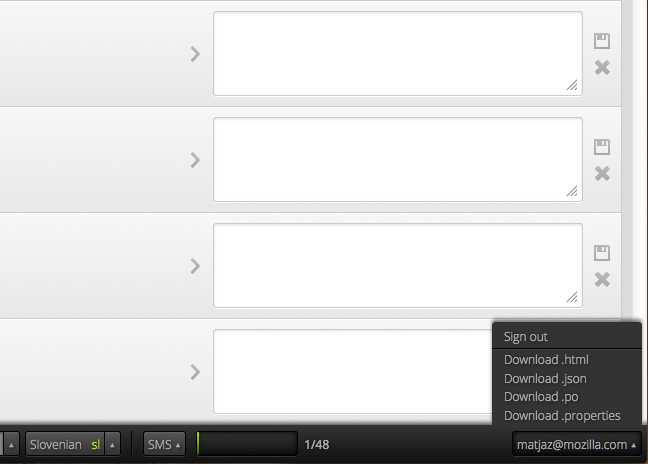 To translate in the app itself hover over any string, click the pencil button and confirm with the save button. It’s fun and useful at the same time, because you can see the context and the space available. 3. A list of strings will load in the main Pontoon window, where you can also translate strings, for example those that cannot be found in the app. Tools like translation memory and machine translation are also available here, as is the menu to switch among apps. Important: Sign in before translating, so you’ll be able to save your work. 4. Once you’re done localizing an app, you can download translations for it as .properties file. You need to push it to HG manually. Some strings cannot be edited in-place, because they are not marked or in an iframe. Users should be able to update translations from HG for their locale themselves. Please file any other issues you have on GitHub. I’d like to thank everyone how has contributed to Pontoon so far either by providing code, feedback or in any other way. Without your help, Pontoon would not be the same thing. We remain open for your contributions. Great work Matjaž, looking forward to try it! Congratulations! Being able to interactively localize parts of FirefoxOS will be really powerful. Thank you, this tool is really helpful!! Are those translations merged with the ones on Pontoon? Nikos Roussos: for now, we are only syncing translations with our primary repository, which is HG.